I'm having the same issues when navigating to an entry in the Common ACL that's set to "deny"
when using the proxy in transparent mode, everything works as expected, SSL interception and all. 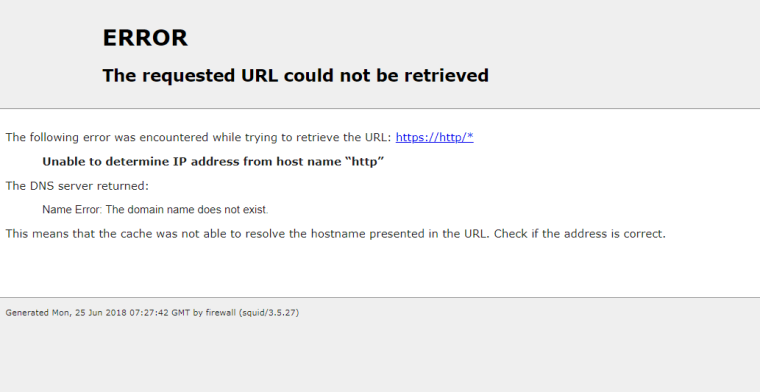 When using defined proxy servers, and the entry is blocked in SquidGuard, I get the following Squid error message. Stolen from another post, but it's exactly the same thing. BH message="squidGuard error parsing squid line"
Seems like this is a bug. Yes, the site gets blocked as expected, so it's not a total loss, but the logging doesn’t trigger and the enduser has no idea what happened. Edit 1: I tried following the other advice regarding disabling "prevent access by IP address" and it did not alleviate the problem. Thanks. Tried that but get ERR on a newline with no details. Nothing in /var/squidGuard/log/squidGuard.log either. @kom Tried a bunch of other options, and I do get a valid redirect link, but only when there should be a redirect. If the URL I pass is one that the proxy should allow, I get "ERR" which I can't imagine is correct? SO, my question now becomes, what's the best way to log what is being sent to the rewrite provider? I'm guessing that Squid isn't sending what it should be. Thoughts? I also get ERR for valid URLs when running that test. No idea why, but my config works just fine. Isn't that enclosed within the quotes? "https://www.testblockedurl.com/ 10.10.2.1 – – GET" I don't know for sure but you would think they use the same method they use for the test. "https://https//www.testblockedurl.com/ 10.10.2.1 – – GET"
Unable to determine IP address from host name "https"
Server Failure: The name server was unable to process this query. This means that the cache was not able to resolve the hostname presented in the URL. Something is causing Squid to spit out a wrongly-concatenated URL when SSL inspection is turned on and everything's bumped by default. I run explicit with WPAD and no SSL intercept. I've never seen this problem. Try increasing the log level for squid and see if it give you any more data. Have you tried using e2guardian?